by Chris Woodford. Last updated: April 27, 2018. So much for the theory, now what about the practice: have you ever stopped to consider what's inside an alarm and how it works? Let's take a closer look! 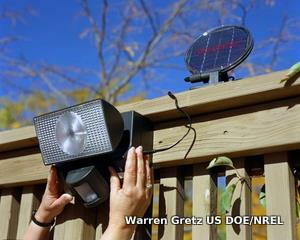 Photo: An inexpensive security light can be just as effective as an alarm. This one uses a solar cell (on top of the roof) to charge a battery that powers an infrared motion detector circuit and lamp. When someone approaches at night, the infrared beam is broken and the light comes on. The battery holds enough charge to keep the device working even if there's no sunlight during the day. Photo by Warren Gretz courtesy of US Department of Energy/National Renewable Energy Laboratory. 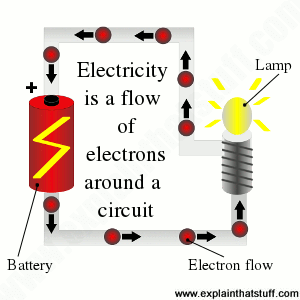 If you've read our article on electricity, you'll know all about circuits. For electricity to flow, there must be a path or circuit that it can travel along and, as the name suggests, that path is usually a closed loop. An electrical circuit is a bit like the loop of a toy train set. Unless you make a continuous circuit of railroad track, the train can't go around. Just about the simplest circuit imaginable is the one that powers a flashlight. When you flick the switch of a flashlight, you're shutting a kind of trapdoor—making a continuous loop of metal so that electrons (the tiny particles that carry electricity) can flow around it, ferrying energy from the battery to the bulb so the lamp can light up. If you've experimented with electrical circuits at school, you can probably already see how something as basic as a flashlight could be modified to make a simple and relatively effective intruder alarm. Suppose we replace the lamp in a flashlight with an electrical buzzer and run a piece of string from the switch to the handle of a door. If we can somehow hold the flashlight steady, maybe by taping it firmly to the floor, what we've made here is a basic intruder alarm. If someone comes in the door, the string will pull on the switch, complete the electrical circuit, and trigger the buzzer. Although intruder alarms are much more complex than flashlights, they are based around simple circuits and switches in just the same way. That's why catching an intruder with an alarm is really an open and shut case—a case of opening and shutting an electrical circuit. A circuit that gets interrupted is the basis of every intruder alarm, but there's a bit more to it than that. Most alarms actually have about half-dozen or so key parts. 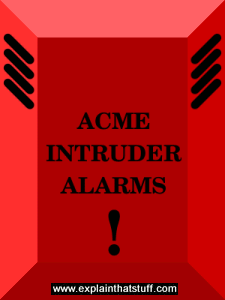 Animation: Intruder alarms are based on two coupled circuits. When the detector circuit is switched on, the alarm circuit is switched off; if an intruder breaks the detector circuit, the alarm circuit switches on. As we've already seen, every intruder alarm is based around an electrical circuit. Like any circuit, the one in an intruder alarm is either switched off (when the alarm is inactive and everything is okay) or switched on (when the alarm is activated after an intruder has been detected). Often, alarms are set up to work the opposite way, so the main circuit is normally closed (when the alarm is inactive and everything is fine) and opens (when an intruder activates it). Either way, when an intruder's been detected, the circuit flips from one state to the other—and that's what activates the alarm. Whatever thieves may be, most of them are not stupid. So, obviously, the switches we use to trigger an intruder alarm have to be subtle and well disguised. Although switches come in all shapes and sizes, there are really only two kinds: ones that detect breakages and others that detect motion. The switches that detect breakages are usually fitted to doors and windows. It's easy enough to make a switch that has two parts, one on either side of the door frame. When the door is closed, the two parts of the switch are close together and electricity can flow between them; when the door is opened, the parts of the switch are forced apart. No electricity can flow and the alarm is triggered. Similar switches can be fitted to windows. Some buildings have metal tape or wires running across or through the windows and carrying an electrical current. If a window is broken, the metal tape or wire gets broken too and the electrical current is interrupted, triggering the alarm. A basic intruder alarm might have a single detector triggered when a window smashes or a door creaks open. But there are usually many different ways of breaking into a house, and even more ways of getting into a large office building, so alarms often have many detectors wired into one or more circuits. We'll run through the various different types of detectors and how they all work in a moment. Even if intruders don't steal anything, they can do an awful lot of harm by breaking windows, splintering doors, chopping through fences, or smashing inside some other way. If you can scare them off quickly, before they've done too much harm, so much the better. That's why most intruder alarms have a very loud bell, horn, or other sounding device mounted in a prominent box outside the building. This serves two jobs at once. First, it acts as a deterrent: just having an alarm box may put off intruders (some people have dummy boxes for exactly this reason). Second, if intruders do get in, a loud alarm may scare them away before they've had time to steal anything. Many alarms also have a flashing strobe light that acts as a deterrent at night, when the alarm is triggered, and keeps on flashing even after the alarm stops to let you know something happened while you were out. Photo: Deterrent: An intruder alarm (sometimes called a burglar alarm) housing on the outside of a building has two jobs. One is to protect the ringing bells of the alarm inside. (The black slots at the top of each side panel let the noise travel out.) The other is to serve as a deterrent to burglars: maybe this building is too much effort to attack? Years ago, intruder alarms had to be switched on and off with an ordinary lock and key, but virtually all modern ones are operated by an electronic keypad. Typically, after letting yourself into a protected building with a conventional lock and key, you then have to disable the alarm by entering a special code in the control panel within a certain amount of time or the alarm will be triggered automatically and the siren will sound. Some alarms can be set and reset remotely, either by telephone or, increasingly often, over the Internet. All the bits of an intruder alarm (the siren, flashing lamp, control panel, and detectors) have to be hooked up somehow to make a complete circuit. Although most of these components are linked by wires, just like any other electrical circuit, some intruder alarms use wireless connections to link the main circuit or the detectors to the control panel. If you think about it, that gives added security. A clever intruder might be aware of how the alarm has been installed and guess that if she or he simply cuts a few wires they can disable the whole thing. A wireless alarm that uses secure, encrypted links between the detectors and the control panel is much harder to knock out this way. Although it might seem trivial to mention it, intruder alarms are electrical gadgets so they need power from somewhere. Most home and office alarms draw their juice from the ordinary electric supply, but that creates two problems. First, what if the building you want to protect is in a remote location where there is no power supply? It might be a trailer or a caravan for example. In that case, battery-powered alarms might be a realistic alternative. Second, and much more seriously, if the alarm relies on ordinary power, what if the intruders realize this and simply disable the electricity? It might sound far-fetched, but in something like a bank heist, thieves will go to enormous lengths to steal large amounts of cash or jewels (and that includes researching exactly how a building is protected). To guard against this possibility, many alarms have secondary power supplies. These are usually either uninterruptible power supplies (UPS), which are a bit like built-in backup batteries that kick-in automatically, or some form of alternative power (maybe a backup diesel generator, if there are other things to protect from a power failure, such as fire alarms and vital computer systems). Intruder alarms aren't much use if no-one hears them or takes any notice! In urban areas, most intruder alarms rely on loud sirens and bright flashing lights to alert people nearby that something is happening. But what if an alarm goes off in the middle of nowhere? There has to be some way to notify people that there's a problem. That's why many alarms have a built-in telephone link that connects either to a remote monitoring center or the local police department. When the alarm goes off, if it's not reset after a certain amount of time, an electronic circuit inside it automatically dials one or more pre-programmed numbers and reads out a pre-recorded message to summon help. Alarm only: A basic home intruder alarm sets off a siren (and sometimes a flashing light) both to deter intruders and to prompt people in the neighborhood to investigate. The trouble with this is that it needs you to live in the kind of place where people care about one another's property. Unreliable systems that repeatedly trigger false alarms are quickly ignored as a nuisance (just like many car alarms). That's why more sophisticated alarms (and more valuable properties) are typically protected in two other ways. Monitored response: Some alarms come with a monitoring contract: an automated telephone link from the alarm calls a local control center every time the alarm is triggered. When the call center detects a problem, it can either send someone to investigate, call the owner, or telephone the local police. Police response: Valuable properties are often wired directly to the local police department, though there are usually conditions attached to police monitoring. You might have to pay a fee and if too many false alarms occur in too short a space of time, the police may refuse to attend any further calls in future. Detectors are by far the most interesting parts of an intruder alarm system, and they come in all shapes and sizes, from basic panic switches you can activate yourself (if you hear a noise at night and you're convinced there's an intruder in your home) to very sophisticated invisible beams that intruders will "trip" if they start sneaking through your home. All these detectors are switches of one kind or another: when they're activated, they turn the alarm circuit on or off, from one state to another, triggering the siren and flashing alarm. What sorts of detectors are there, and how do they all work? Artwork: A microswitch (red) could be held in place by a pane of glass (grey). If the glass breaks, the switch pops out and triggers the alarm (yellow). A microswitch is a tiny spring-loaded switch slightly bigger than a pencil point. If it rests against something, such as a door or a pane of glass, the switch is pressed in and normally in its "off" state. If the door opens or the glass breaks, the switch pops out and flips into its "on" state, activating the alarm circuit. Microswitches are simple, cheap, and relatively effective, but they're also quite conspicuous, which means they can be easy to disable. If you're in a museum, you might have noticed that some of the more valuable objects are locked in glass cases, with microswitches pressing against the panes of glass to trigger an alarm if you smash them. Unfortunately, if you can see a microswitch and you know what it is, it's relatively easy to disable it by holding something against it. Shop windows often have lengths of metal foil or tape (similar to aluminum foil but self-adhesive) running along their sides, which are wired into intruder alarm circuits. If someone breaks the window, it rips the foil (which is made very thin so it tears easily), interrupting the circuit, and triggering the alarm. Just like microswitches, metal foil detectors are easy to install and inexpensive, but they can be even more conspicuous, which means a savvy intruder will generally work around them will find some other way to enter the building. Artwork: A reed switch like this (fixed to a door frame) has two metal contacts inside that held apart by a nearby magnet (hidden in the door itself). If the door opens, the magnet moves away, the contacts spring apart, the current no longer flows through the reed switch, and the alarm goes off. The best detectors are completely hidden: intruders get no hint of how the building is protected, which makes their job that much harder. One very popular kind of detector uses magnetism. It's called a reed switch and it's a small piece of glass or plastic with two tiny metal contacts inside it. In one design of reed switch (called normally open), the contacts are held together by a nearby magnet so the switch is turned on by default. If the magnet moves away, the contacts spring apart, breaking a detector circuit and triggering an alarm circuit. It is easy to see how we could use a reed switch like this in an intruder alarm. We'd simply place the reed switch in a door frame and a magnet on the door. With the door closed, the magnet would be very near the reed switch, holding the contacts apart. If the door opened, the magnet would move away from the reed switch, allowing the contacts to close and switch the circuit into its active state. The beauty of reed switches is that they use invisible magnetism, so they're relatively easy to conceal. Artwork: An inertia switch is typically made from a metal ball (red) that slides back and forth to or from a pair of metal contacts (black). In its usual position, the ball is well away from the contacts. If the object the switch if attached to moves, the ball slides towards the contacts, activates the circuit, and triggers the alarm. An inertia switch is a simple way to detect when something moves or tilts. Like the other switches we've seen so far, it's a very simple electrical device: it's often made with a metal ballbearing that slides back and forth inside a plastic tube, towards or away from a couple of contacts. When the switch is in one position, the ball sits against the contacts so current flows through them and the outside circuit; if you move the switch, the ball rolls away from the contacts, breaking the circuit and triggering the alarm. Inertia switches are widely used in cars. If you've seen Tom Cruise dangling from the ceiling in the movie Mission Impossible, you'll know all about motion detectors. They have two parts: a transmitter that sends out an invisible beam of infrared radiation and a receiver that detects the beam some distance away. Normally, the receiver picks up a steady signal from the transmitter. But if someone walks into the room and interrupts the beam, the receiver stops picking up that signal. The circuit attached to it will notice straightaway and set off the alarm. Ultrasound beams (sounds of such high frequency that people cannot hear them) are sometimes used in place of infrared light. Photo: A photoelectric cell (also called a photocell, light-dependent resistor, or LDR) like this is used to detect the beam in invisible, infrared, motion detectors. Active infrared detectors work in the same way as the Mission Impossible setup: there's a transmitter throwing one or more beams out across the room and one or more receivers (photoelectric cells) picking the beams up. If one of the receivers suddenly stops detecting a signal, it means a beam has been interrupted and (possibly) that an intruder has been detected. Passive infrared detectors also use infrared, but in a totally different way. They rely on the fact that hot objects (including human bodies) give off infrared radiation. In this case, all we need is one or more infrared detectors that can pick up any radiation inside different "zones" in a room or a building. A decent detector will use a sophisticated electronic circuit to detect when infrared radiation (human body heat) is picked up in one zone. But it will keep quiet until heat is picked up in one or more neighboring zones (indicating that a person is moving through the building) from zone to zone, at which point, it will trigger the alarm. Ultrasound is high-frequency sound beyond the range of human hearing: bat and dolphin squeaks are examples. Although we can't hear ultrasound, we can use it to detect intruders in a similar way to infrared, by bouncing it around the inside of a building. An intruder's movements subtly change the frequency or amplitude of the sound waves, so it's relatively easy to detect. Why would we use ultrasonics instead of infrared? There might be some issue with the building we're trying to protect that makes it difficult to detect body heat (it could be a very hot building, perhaps, or one that's highly ventilated—or there might some other reason why body heat can't be reliably detected). Some intruder alarms are designed to be manually triggered if necessary. For example, banks generally have panic buttons hidden under the counters (and in various other places) so staff can set off the alarm themselves if a robber appears and menaces them for cash. Switches like this have to be designed so they can't be set off accidentally; sometimes they use the same "break glass" approach as a fire alarm. While most of the detectors we've looked at so far are designed to trigger an alarm if someone enters a building, there are also detectors that can be used outside, around the perimeter of a secure location such as a fenced office complex. Typically, they use things like fiber-optic cables (the "light pipes" that are used to carry telephone calls as optical signals) or piezoelectric sensors (ones that generate pulses of electricity if things press them) that can detect vibrations in fences. Since there's always a risk of animals or weather triggering false alarms, detectors like this generally alert security officers to investigate rather than immediately setting off sirens, though they can be set up to activate things like floodlights as a deterrent. Carbon monoxide detectors: How can you spot a gas that's invisible and has no smell but can kill you in minutes? Electricity: Where does electricity come from and how is it made? Smart homes: Why stop at automating the security? Why not automate the whole house?! Smoke detectors: Now you know how to spot a burglar, but can you detect a fire? Intruder Alarms by Gerard Honey. Newnes, 2007. A detailed, professional's guide to alarms that runs through circuits, detectors, power supplies, and more. Home Security: The Complete Handbook by Calvin Beckford, Heather Alston. New Holland, 2005. A good, general introduction to planning for a safer home. The Complete Idiot's Guide to Home Security by Tom Davidson and Lorna Gentry. Alpha Books, 2001. These are particularly suitable for hobbyists and younger readers. MAKE Electronics by Charles Platt. Maker Media, 2015. This "learn-by-discovery" book introduces you to electronics by getting you to build and understand simple projects, one of which is an intruder alarm. Building a Home Security System with Arduino by Jorge R. Castro. Packt Publishing, 2015. Building and programming an Arduino-based intruder alarm. 15 Dangerously Mad Projects for the Evil Genius by Simon Monk. McGraw Hill Professional, 2011. Mainly for younger readers. One of the projects you can build is a laser-grid intruder alarm! How Thieves Can Hack and Disable Your Home Alarm System by Kim Zetter. Wired, July 23, 2014. Unencrypted radio-wave signals used by home alarms are easy for thieves to block or disrupt, researchers find. Burglar alarms: Are they really worth buying—and which type is right for your home? by Jill Papworth and Patrick Collinson. The Guardian, December 10, 2005.A (UK-geared) buyer's guide to different alarms and how much you can expect to pay for them. Alarming Data On Security Alarms by John Rather. The New York Times, January 25, 2004. A study of police response finds over 99 percent of reports about burglars are false alarms. Instructables: Pocket Burglar Alarm: A tiny portable infrared alarm built into a cigarette lighter case that you can use in all kinds of different ways. Very cool! Instructables: Make your very own laser burglar alarm: A magic-eye type alarm that uses a laser diode and a photocell to make an invisible light beam.